The historic rainfall dumped by Hurricane Harvey has already led to deaths by drownings and the destruction of many homes. 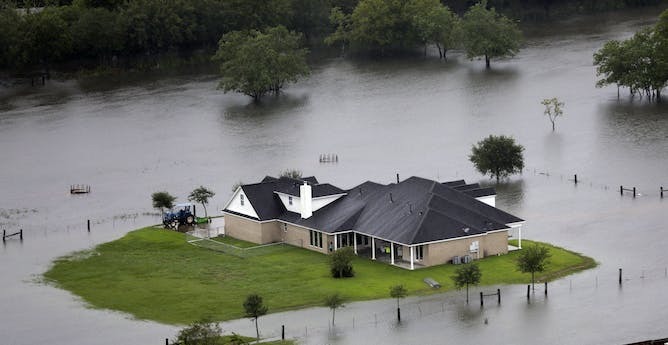 Houston’s drinking water system is being stressed by overflowing water reservoirs and dams, breached levees and possible problems at treatment plants and in the water distribution system. Failure of drinking water systems could lead to water shortages. As a civil engineer who has studied how flooding affects water systems, I also see a number of public health concerns. Raw sewage, dead bodies in the water and release of dangerous chemicals into the floodwaters could lead to the spread of disease through contact with contaminated water and to infection through open wounds. And because Houston has at least a dozen sites that have been designated environmentally hazardous, there is a risk of petrochemical contamination. Indeed, companies have reported that pollutants from refineries have already been released. As if those are not bad enough, the “unprecedented” amount of water leads to the perfect breeding opportunities for mosquitoes, which are vectors of Zika and many other infectious diseases. Flood impacts hit hardest on the most vulnerable and exposed people, especially children, the elderly and disabled, and the poor. A Houston home surrounded by water. The city anxiously watches the rising levels of water in levees and dams. In Houston, several authorities are involved in flood mitigation and rescue efforts, beginning with city government, which handles street runoff and storm drains as well as emergency response. The Harris County Flood Control District, which was organized in response to devastating Houston-area floods in 1929 and 1925, has a regional flood control program. It works with the U.S. Army Corps of Engineers, which operates local reservoirs that were built in the 1940s to prevent flooding. The National Guard and the Federal Emergency Management Agency also are helping, along with local shelters and community members. The scenes of rescues during and immediately after the storms from Harvey may suggest that relief has arrived, but these images hide the aftermath of disease and misery. This includes the risk of contamination from floodwaters from many unsavory sources, beginning with raw sewage from failing sewer pipes. Other sources of bacteria and disease agents are landfills, septic tanks, medical wastes, feedlots, cemeteries and portable toilets. This toxic soup can lead to a host of infectious diseases, diarrhea and wound infections, among other medical problems, when bacteria and parasitic organisms in floodwaters penetrate the body. Yet despite the threats from polluted floodwaters, most diarrhea is caused by failed drinking water systems. The massive supplies of bottled water distributed after the flood can help, but getting drinking water systems up and running again is essential, albeit a formidable challenge. These systems are designed to provide multiple barriers to protect the water sources, treatment plants and distribution pipes from contamination. Mold and mildew, meanwhile, can harbor disease agents that affect respiratory systems long after floodwaters have dried. Mosquito-borne illnesses such as malaria and dengue are endemic in flooded areas. Then, chemical and explosive hazards can affect people in ways ranging from cancer to exposure to fire and detonations. There is also trauma from flooding which can can take many forms, such as blunt force injuries due to flash floods or explosions. Objects such as propane bottles and fuel tanks should be anchored to prevent them from being released. Traffic disruption and failure of structures, such as bridges and culverts, can cause injuries as well. Thirty years ago, a New York State Thruway bridge collapsed from flood damage, killing 10 people. The cause was damage from erosion to supporting bridge piers, which travelers could not detect or see. If we are to learn more about flood-induced injuries and diseases, better data are needed. Epidemiological studies of flood impacts are limited, particularly in study of long-term mental health, mortality risks after flooding, risks of infectious and vector-borne diseases following floods, and the effectiveness of public health measures in reducing flood-related health burdens. Moreover, the health-related costs of flooding are not considered adequately in decisions about remedies, and little is known about the effects of climate and land-use change on flood risk and health burdens in different settings. The Houston disaster was caused by an unprecedented flood, but other rare and extreme ones occur. They are in the U.S. headlines for a few days, and then they disappear, especially when they happen in faraway places. The 2010 Pakistan flood affected 20 million people, but it disappeared from the news within days. In worst-case scenarios, floods can kill hundreds of thousands and maybe millions, as one did in China in 1931. In countries with limited resources, people are mostly left to fend for themselves. What can be done to alleviate future suffering from such massive events? Flood science has some of the answers, but not a complete solution. The good news is that most flood threats occur from frequent events, which can be mitigated by a combination of steps that include adequate infrastructure and so-called nonstructural tools, which means they involve measures such as zoning, flood warning and insurance. These, along with pollution control programs, can go a long way toward alleviating the worst impacts of flooding. The catch is they must work, and this requires the rule of law and good governance, which are unfortunately lacking in many parts of the world.